Here's a refreshing way for you to provide your body with vitamin C, electrolytes and other important nutrients to support your immune system as well as healthy energy levels. 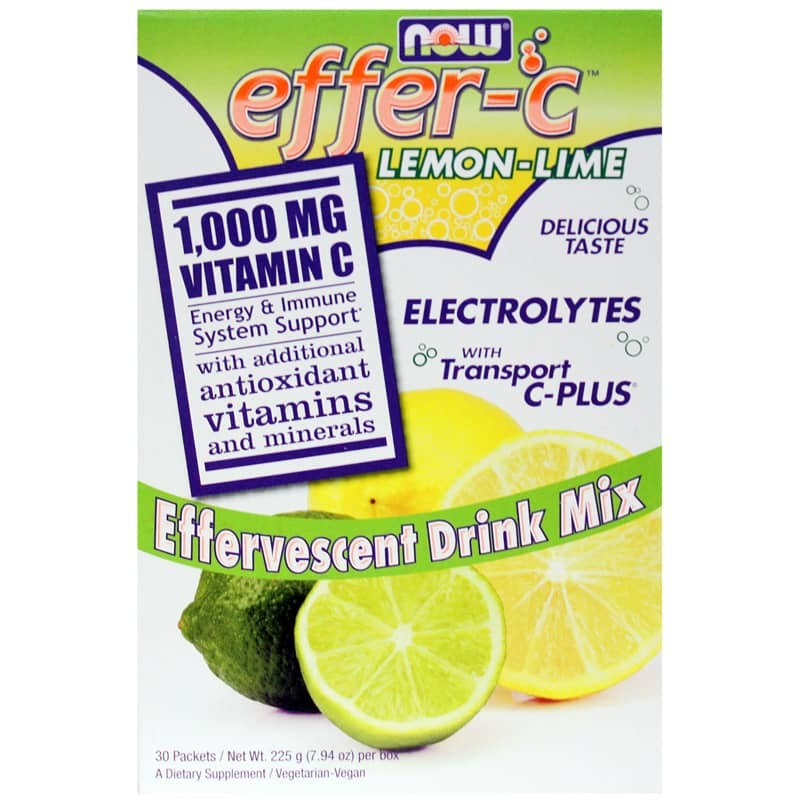 Effer-C Lemon Lime from NOW Foods comes in convenient packets, so you can take your antioxidants and electrolytes wherever you go. To the gym, to the office, on vacation - these single serve packets make it easy to maintain a healthy immune system while potentially boosting energy. The proprietary blend of essential vitamins and minerals in this bubbly drink mix are formulated to support optimal wellness all year long. That includes Transport C-PLUS, a special, buffered form of Vitamin C that's combined with Alpha Lipoic Acid for faster absorption. ALA is also known to help the body regenerate Vitamin C.
The entire B-vitamin family and vital electrolytes are included to support energy production and replenish what your body needs. The citrus flavor is enhanced with BetterStevia, giving it that perfect touch of sweetness without impurities. 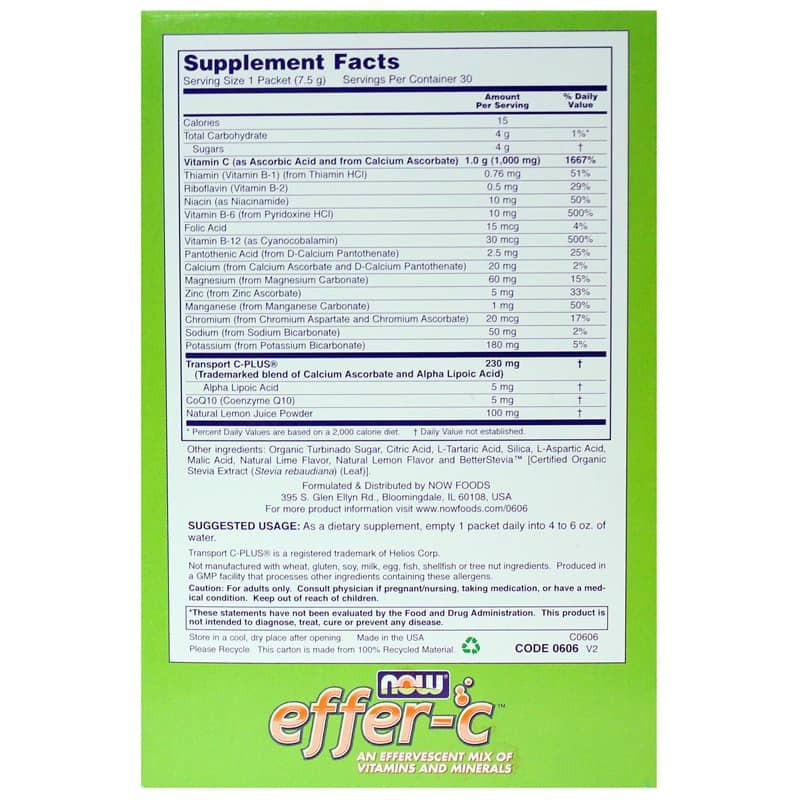 Just mix up Effer-C in a glass of water and enjoy both the taste and the potential health benefits. 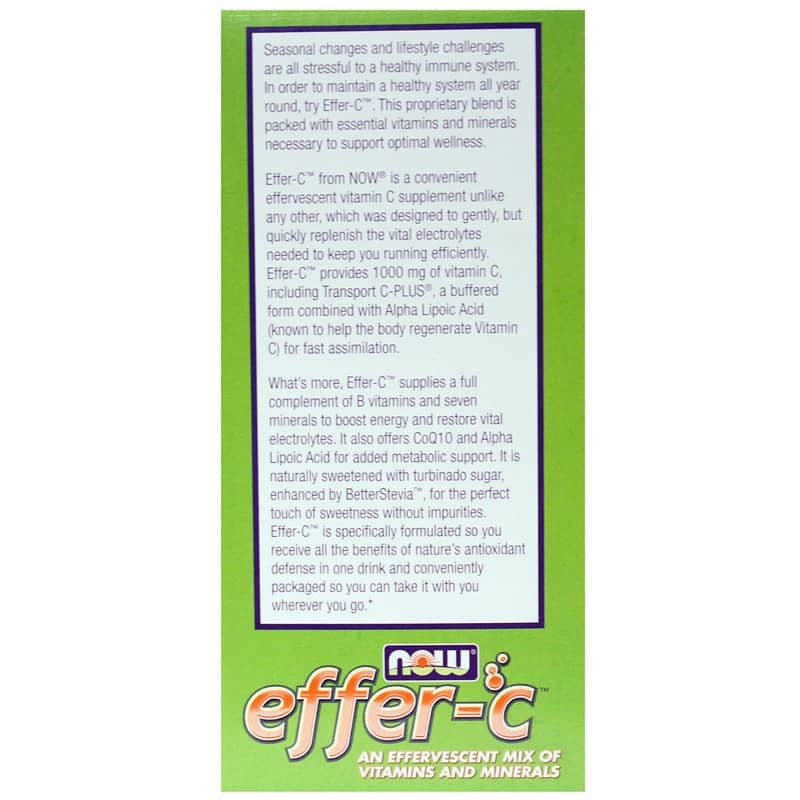 Order Effer-C Lemon Lime from NOW Foods so you can take protection and nutrition on the go! Other Ingredients: Organic Turbinado Sugar, Citric Acid, L-Tartaric Acid, Silica, L-Aspartic Acid, Malic Acid, Natural Lime Flavor, Natural Lemon Flavor and BetterStevia [Certified Organic Stevia Extract (Stevia rebaudiana) (Leaf)]. Adults: Mixing Instructions: As a dietary supplement, empty 1 packet into 4 to 6 oz. of water. Use I packet 1 to 2 times daily. Caution: For adults only. Consult physician if pregnant/nursing, taking medication, or have a medical condition. Keep out of reach of children. Store in a cool, dry place after opening.